This came as a surprise to me. What young kid is interested in a castle built as a summer palace for Christian IV, a royal I had barely heard of? Although we did spare them going inside and thus having to behave while mom and dad ogled the royal jewels (next time, boys). Instead, we admired the castle from all its angles while they ran free around Kongens Have, which surrounds the property. 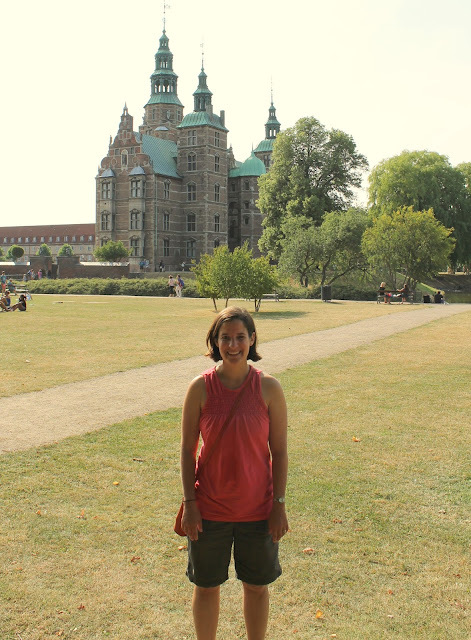 (Kongens Have translates to the appropriately named King's Park). I really enjoyed its deep red brick facade, which gives it a very unique look compared to other castles I've seen. But my children's appreciation for masonry is relatively limited. 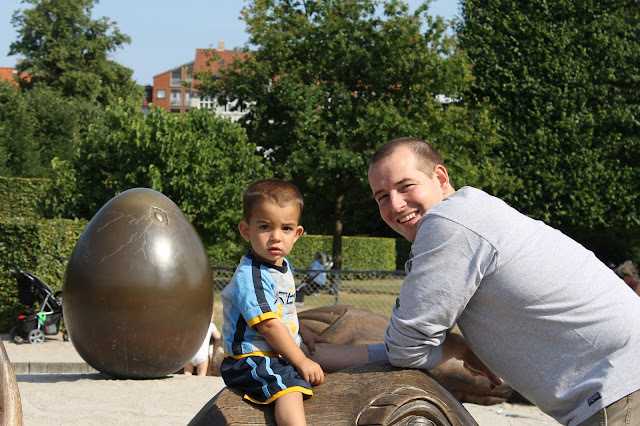 So the fun factor really revved up for them when we discovered a children's play area in Kongens Have. Here they could climb on dragons with daddy. And the ultimate, take a splash in the water on a hot summer's day. 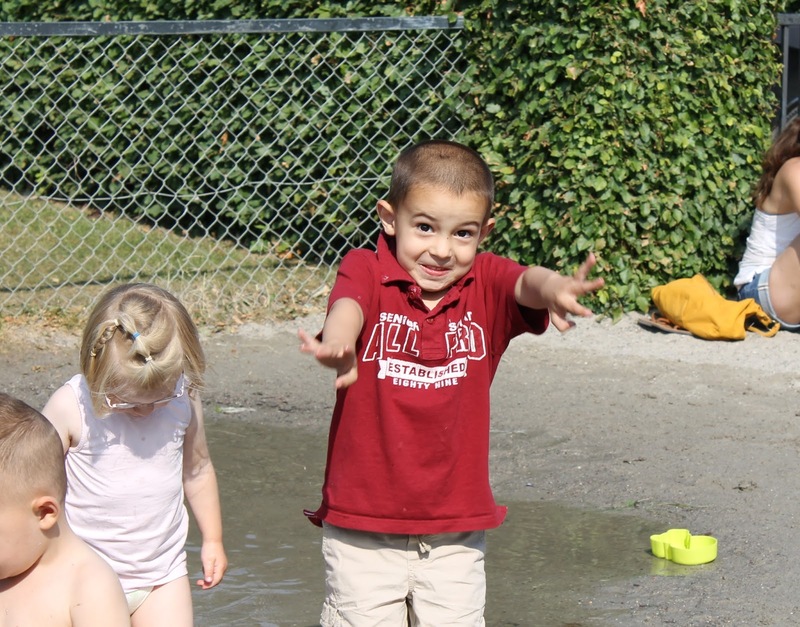 We were completely unprepared for sand and water play. So we did like the locals, and stripped them down to Mickey Mouse undies and a diaper. It was relaxing for my husband and I to just watch the boys play and interact with kids of all types of cultural backgrounds. 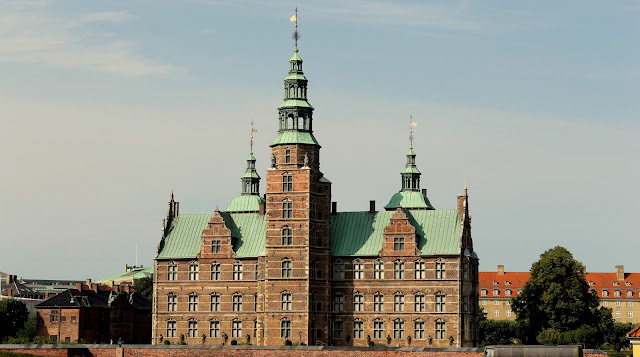 And with the turrets of Rosenborg Slot standing watch over us, we still felt a strong presence of exciting travel, not just an ordinary visit to the playground. Fun fact: At the time it was built in 1606, Rosenborg Slot was out in the countryside, thus making it the perfect summertime retreat for a busy king. But a few hundred years have passed, and now it has been enveloped by Copenhagen itself. You can easily walk there from the city center. And while you're more apt to hear cars honking instead of horse hooves clopping down the streets surrounding it, it was fun to imagine.